It's that time again already - welcome back, Sweetnicks! Glad you had a wonderful holiday! My entry this week is avarakkai - a kind of flat broad green bean that tastes a bit like runner beans but is way better than that! 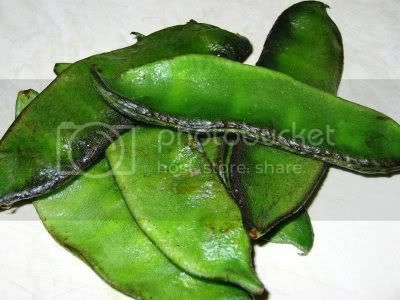 I would give the English name for this vegetable, but I dont know what it's called. So it's going to stay Tamil and be known as avarakkai. 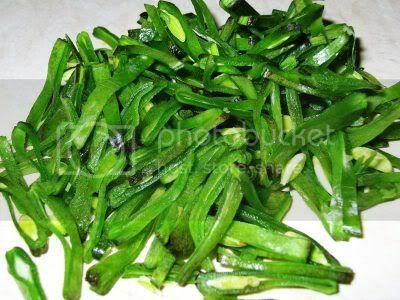 Avarakkai really are my favourite kind of fresh beans. Nowadays French beans (or snap beans) have had the stringy bit bred right out of them, but avarakkai need the string removing before slicing. You can cook it with sliced onions or add fresh grated coconut to it once it's done, and both versions are nice in their own way. But I like it best the way my mother makes it for me - which is simply sliced, seasoned and pan fried. It's best not overcooked (even though I like it shrivelled) and if, like me, you like the natural, sort of juicy taste of fresh green beans, this is the only way to have them! I got my avarakkai from a vegetable shop in Southampton last weekend - it was a revelation to see just how much variety there was in groceries "down south", as they call it... all sorts of vegetables and fruit from all over the world, some that I knew and some that I didnt.To think I thought Birmingham was good for fresh "Indian" vegetables...! I would have loved to experiment with some of the unknown (to me) vegetables, but I didnt buy any because I knew I wouldnt have enough time to do them justice... there wouldnt have been much point buying stuff that would have just gone waste. But how I wish that variety was available closer home! Oh well. That's what I get for living up North. 1. Heat the oil in a pan and do the seasoning, covering the pan till the mustard seeds have popped. 2. Toss in the sliced avarakkai and stir well to coat. 3. Turn the heat down low and cover the pan, letting the beans steam-cook for 8-10 minutes. 4. Uncover the pan and add salt to taste. Mix and turn the heat up for 3-4 minutes, stirring occasionally, until the beans start to become a bit brownish. 5. Serve hot as a side dish with steamed rice and sambar or other South-Indian gravy preparation. Shammi, do you take the pics at night? If you do, what kind of lighting do you use? I got this doubt because i thought you work full-time. And your blog is great! I've been following it for a long time now. correction...thanks for visiting "my " blog .. The bean is called "Hyacinth Bean" in the western world. And oddly enough, people don't consider it as an edible vegetable. I grew up in South India and love this bean and do grow it in by backyard in california. I bought the seeds off a catalog. They are sold as decorative vines for their beautiful flowers. I'd love to see your take on swede (the vegetable, not the blonde), avocado, parsnip, lettuce and savoy cabbage. All of the above mentioned get purchased regularly and get binned without fail. Meenal - welcome to my blog. I had a pretty good day, thank you! Ashley - thank you for your kind words, and for providing a name for these beans. And what a pretty name, too - hyacinth beans! I've gotta see if I can get them here and grow them. Love avarakkai. I usually make it with coconut. Great entry for ARF! Wow! I havent seen these in ages. I remember seeing them grow in the paddy fields..I remember loving the texture of it. I've never seen avaraikai in ages. Can't recall when was the last I ate it. Thanx for reminding me of it. Very nice blog u have. Keep up the good job. Thanks for your kind words, Pushpa. Actually this was the first time in the last 4-1/2 years that I saw avarakkai here! 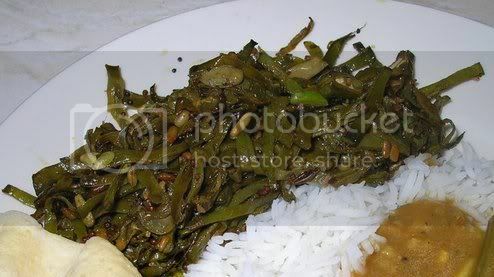 Is there an easy way to chop beans, avarakkai etc like a chopper or something? 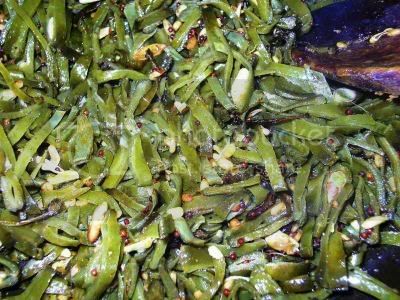 You have chopped the avarakkai very finely. You definitely have a lot of patience!